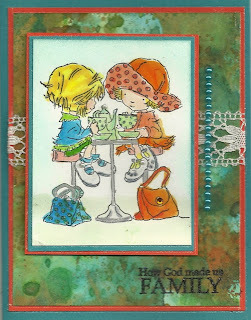 I used Antique Glimmers to create the background for this stamp. Then I used Memento Black ink to stamp the Key Script background stamp over all. http://techniquejunkies.com/key-script/ I swiped my anti-static sack over the vellum so I wouldn't get stray dots. 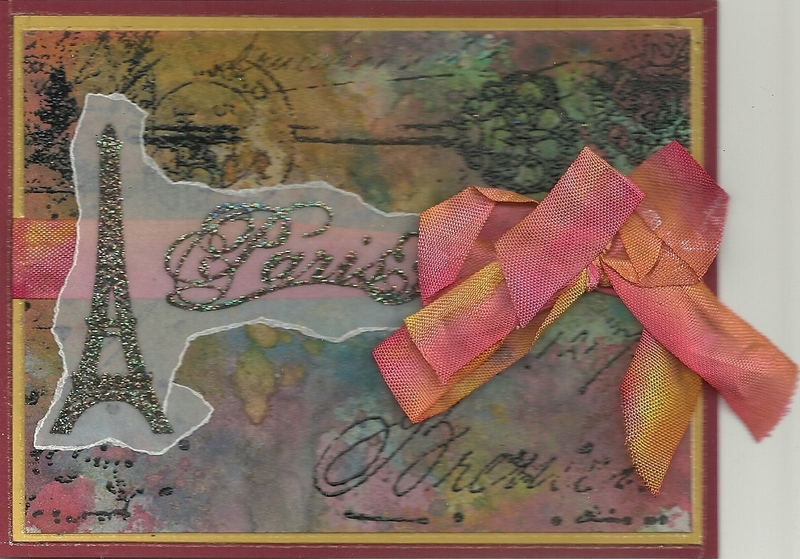 Then I stamped the Bold Eiffel stamp http://techniquejunkies.com/bold-eiffel/ and the word Paris http://techniquejunkies.com/fancy-paris/ near each other on a piece of vellum. 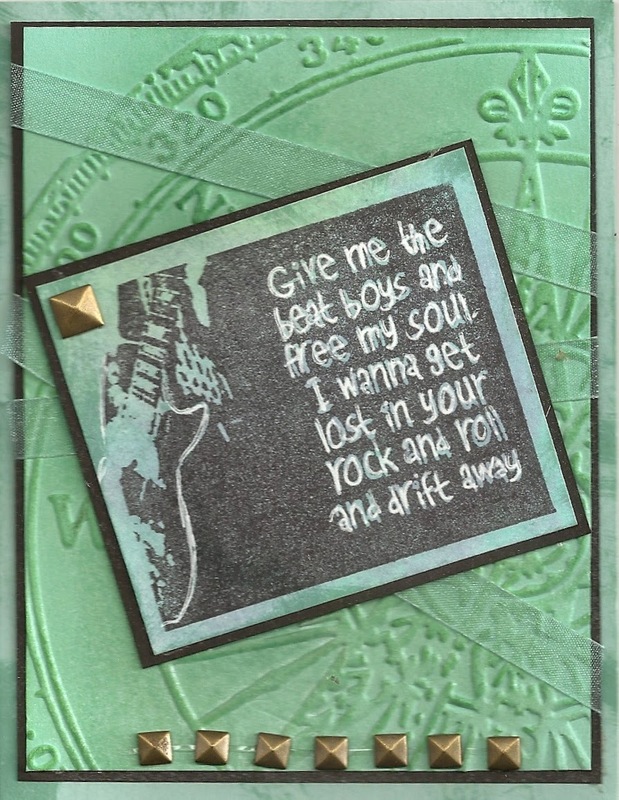 I used Versafine Black ink and used a glittery black embossing powder over all and heat set it. After it had cooled a bit I tore the vellum b fore I mounted it. I ran the vellum through my Xyron machine to apply adhesive. To get the ribbon, I used seam binding which I had purchased on a large spool of white seam binding -- such a huge saving! I used 2 markers (red and yellow) and only let the marker sit on an edge, pulling the seam binding under the marker's brush tip. I did that on each side and the marker ink was NOT evenly distributed on the edge. Some places were darker than others. Then I spritzed the seam binding with just enough water to make the ink run on the seam binding. Then I took it over to my "non-stick" round cake pan (which I bought at a flea market for a quarter) and laid it inside. I dried it with heat gun and tied it around the card. Then I adhered the vellum over top. 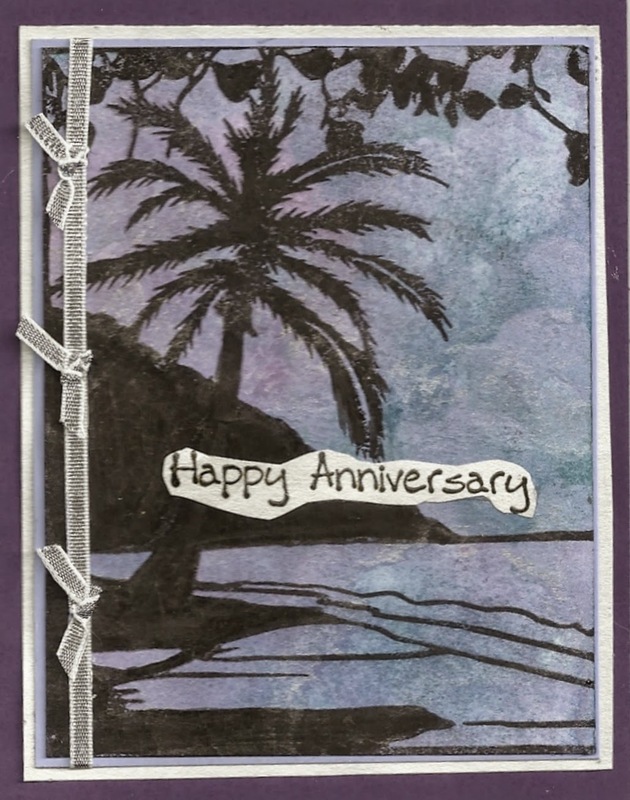 As you can guess, by the time I finished this card my fingers were very inky! Will you get your fingers inky today? 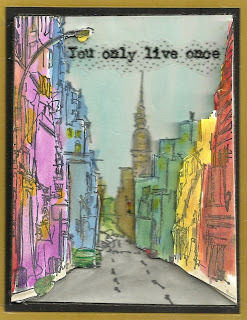 Watercolor New York - Awesome Stamp! One of the things I love about Technique Junkie Stamps is that Pat Huntoon keeps updating the stamp line with new stamps every month! That is so fun! This is a stamp that was added to the line a few months ago, but I only recently got this stamp. And since I really enjoy watercoloring, it was a perfect stamp for me! So I have three cards made to showcase this stamp for you today. I hope after you see the stamp made into these three cards, you will say I love this stamp and I must have it --- NOW!! For this card I used the Antique Glimmers technique trying to keep most of the gray area at the bottom of the card stock. 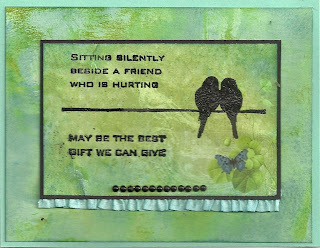 I used Shimmery White card stock from Stampin' Up. It is a beautiful card stock. It takes watercoloring very well. I inked the image with Stazon black ink so the amount of water I used would not cause the image to distort and blur. 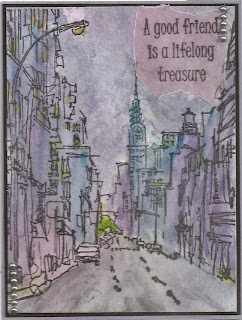 After I stamped the image on the card stock with the Antique Glimmers applied, then I used Peerless Watercolor paints http://techniquejunkies.com/peerless-watercolors/ which Pat sells on the Technique Junkie website. These colors are very intense and of so very portable! I used these paints to deepen the colors and to add additional texture to the image. 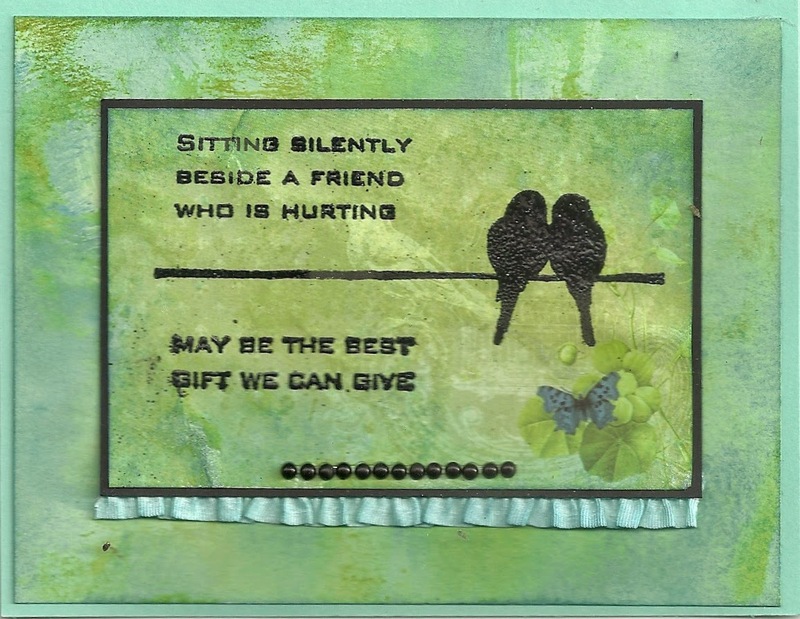 The word stamp is called Good Friend -- http://techniquejunkies.com/a-good-friend/ -- and I think this saying is so very true. We have friends from many years ago and they are truly a treasure for us! 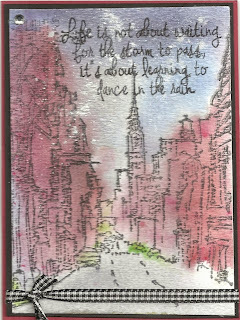 I stamped it on vellum with a hint of mauve and adhered with adhesive from my Xyron machine. This is the second card I created with this stamp. 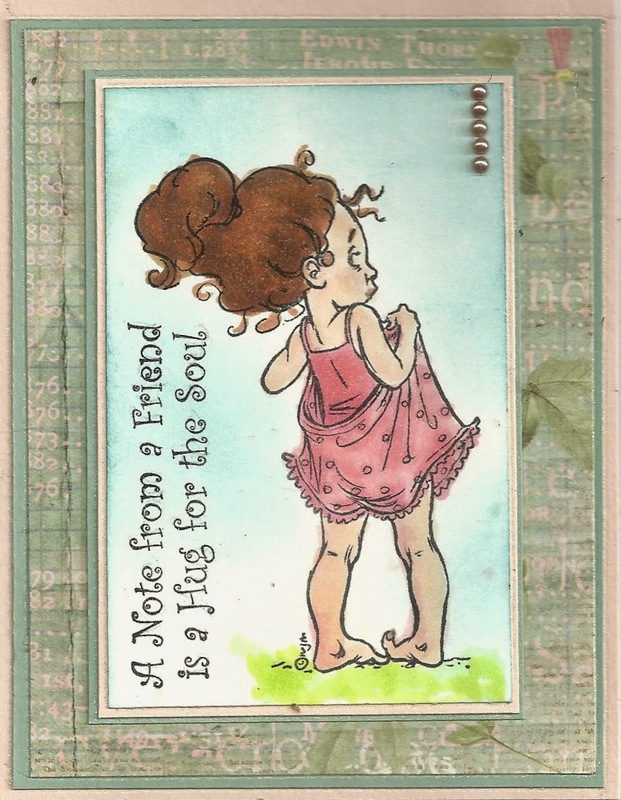 I stamped this image with Stazon ink on watercolor paper. Then I spritzed a fine mist of water all over the card stock and I applied just dabs of the intense color from the Peerless watercolor palette. I spread the colors on the area where I wished it to be. Then I quickly grabbed my heat gun and dried the card stock to stop the blurring. Then I squeezed a small amount of water from my water brush onto the next areas I wanted to add color and spread it around. Then I added a few dabs of that intense color on the wet area until I got the look I was looking for. I grabbed the heat gun again and dried the card stock. Then I repeated this process until I was finished with painting. Then while the sky was still damp I sprinkled tiny bits of Perfect Peals to sort of imitate rain. The stamp for the verse is called Dance in the Rain - http://techniquejunkies.com/dance-in-the-rain/. 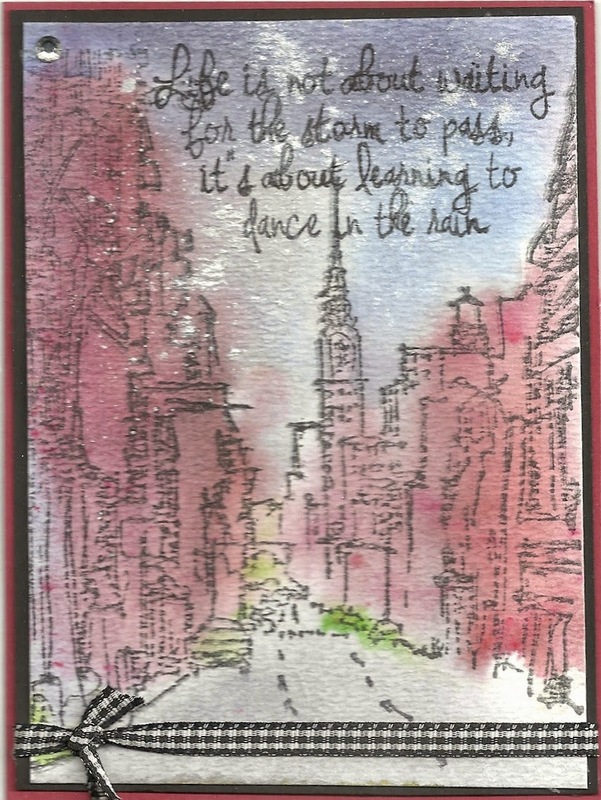 I thought it was perfect for the gray, rainy NYC skyline. I stamped it with Stazon black right on the sky. Have you ever seen or used the Peerless watercolors? They are just wonderful to use with a water brush where you put water in the barrel of the brush. Makes them easy to use, and very portable. 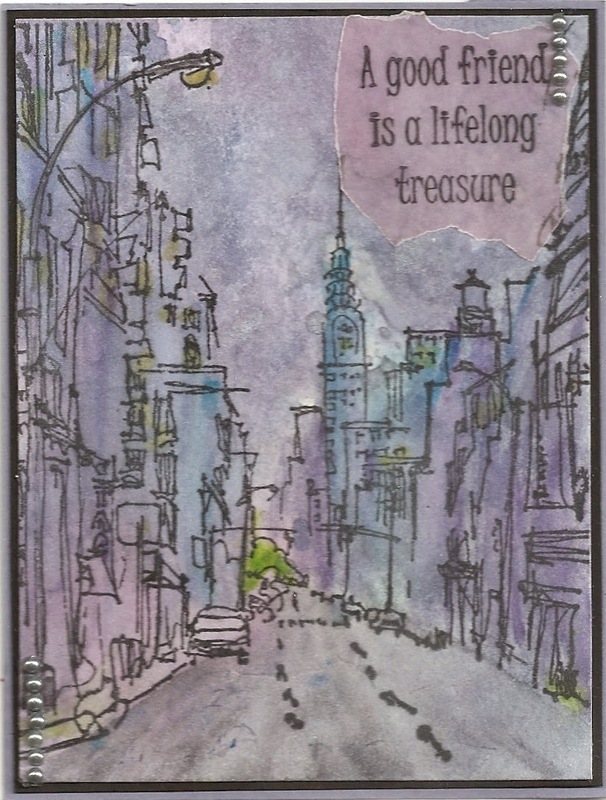 My last card for you today still uses this same Watercolor NY stamp but I have applied a different technique. I truly wish you could see this card -- the scan doesn't do it justice. I used a technique from the December 2010 Technique Junkie newsletter called Deconstructed Collage. The base layer of the card is stamped with black Stazon on Stampin' Up's Shimmery White card stock on three pieces of card stock. Then I painted Twinkling H2Os all of this layer. The same colors were used to paint the other two sheets of card stock. Then I cut out sections and built up the layers. I used a yellow marker to color areas for windows. I used a Star Dust glitter gel pen to add highlights here and there. There are a total of three layers. Can you see the layers? The sentiment is from the stamp set called Mae West Sentiments - http://techniquejunkies.com/mae-west-sentiments/. I only used a small section from the stamps. It is stamped with just a black marker on vellum and quickly covered with black embossing powder, and finally heat set. Because all ink dries so slowly in vellum, it is easy to heat emboss. I used one of my Zyron machines to apply adhesive and adhere to the skyline. I hope you have a look around the Technique Junkie website. There is so much yummy stamping goodness to discover. There are not just stamps but lots of other things. And if you see a stamp that interests you and to see cards made with that stamp, hover over the stamp image with your mouse. You should see the words "Quick View." Click on that and a larger image of the stamp will show up. Now you should see the words "View Details" on the right. Please click on that and you will see cards or projects some of the Design Team members (or Pat herself!) have created with that stamp. I will say that not every stamp has samples in a gallery because this is a relatively new feature for the TJ website. The Design Team does not own every stamp that Pat produces. Oh, we wish we could but money is a limitation for everyone! Go look and see what you can find! Today I want to show you two cards using the same stamp. This stamp is called The Best Gift - http://techniquejunkies.com/the-best-gift/. I used the Antique Glimmers technique in different ways on these two cards. 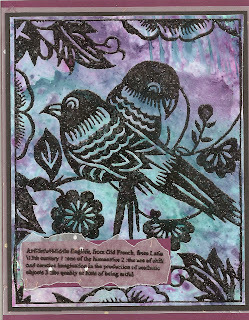 For the burgundy card, this technique is on the panel where the birds are stamps. Then that is layered on three pieces of card stock to get the look I wanted. That was then layered on the burgundy background card stock. 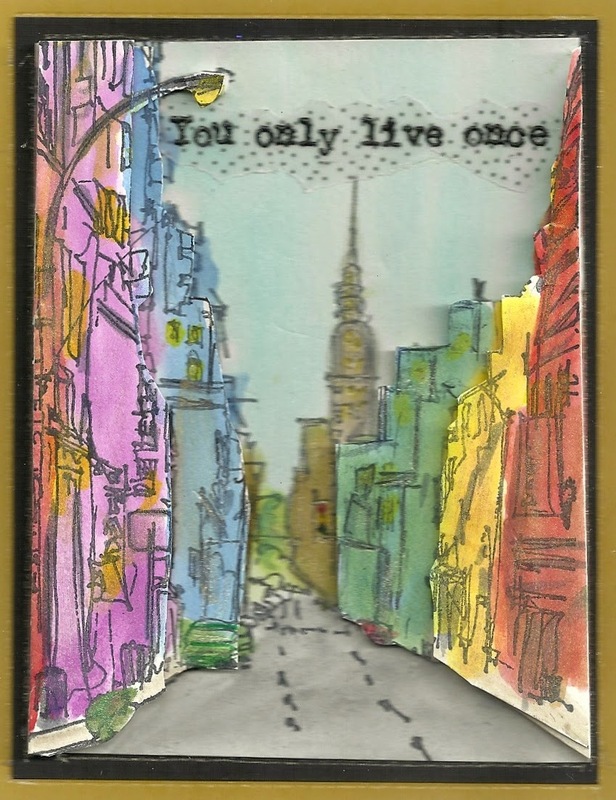 For the green card, I used a piece of background paper that had a lot of open areas and was light in color. Then I used that piece and applied the Antique Glimmers technique to it. The back panel also has similar colors for the Antique Glimmers technique. 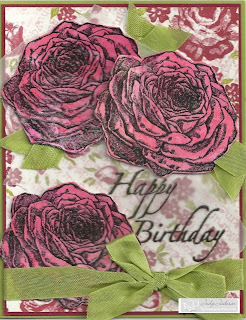 Both cards have different embellishments and you see I have two different looks for these cards. Have a lovely inky day! One of my doctors is adopting two little blonde girls who are sisters. My doctor won't show me a picture until it is finalized so I really have no idea what they look like except she told me they are blonde. I know the girls are sisters an the adoption will be finalized sometime in May -- now! So I made her a card to celebrate. I already sent the two girls a small gift to have on the plane. It wasn't much - just a doll, a note pad, and a small tote bag for each girl. Each gift was small - and not heavy because I well know the weight restrictions for luggage. This was so that the girls will have something to play with on the plane ride to their new home. The stamps for the little girls having tea is from Lily of the Valley - an English company with FREE shipping for stamps. The verse is from Sweet and Sassy Stamps. It is in a Adoption word set on her web site. I used both water coloring and Copic markers to color these two sweet girls. I will be praying for my doctor and for the children. The children are not from this country, and my doctor doesn't speak their language. Both are going to have "culture shock." I cannot imagine doing this. Have an inky day today! I have a friend who is going through a difficult time right now. I think it is good to send encouraging thoughts, prayers, and cards during such times. She said to me on Saturday, that even though she was upset, she pulled herself up, put on her Big Girl pants and did what she had to do. So I created this card just for her. I think she will laugh when she gets it in the mail. The girl stamp is from Stamping Bella. The inside stamp --also from Stamping Bella - says "You can handle it, you've got your Big Girl pants on." The verse on the front is from an unknown vendor -- from before I needed to keep track of the correct vendor for each stamp. I used Copics to color the image. Send an encouraging note to someone soon. This is a Mother's Day card I created for one of my daughters. It uses Heart of the Home stamp http://techniquejunkies.com/heart-of-the-home/ and Whimsical Garden http://techniquejunkies.com/whimsical-garden/. I used Antique Glimmers technique (see - I said it was a favorite technique!) to create the background paper for the stamp. Have you tried the Antique Glimmers technique? 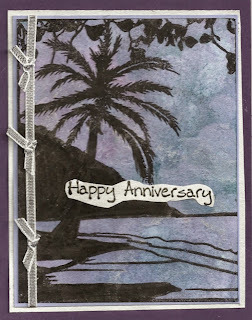 Then I layered it on some black card stock and then some designer paper from Lily of the Valley. Add some ribbon and some bling - and it is done. I hope you get inky and do some stamping today. 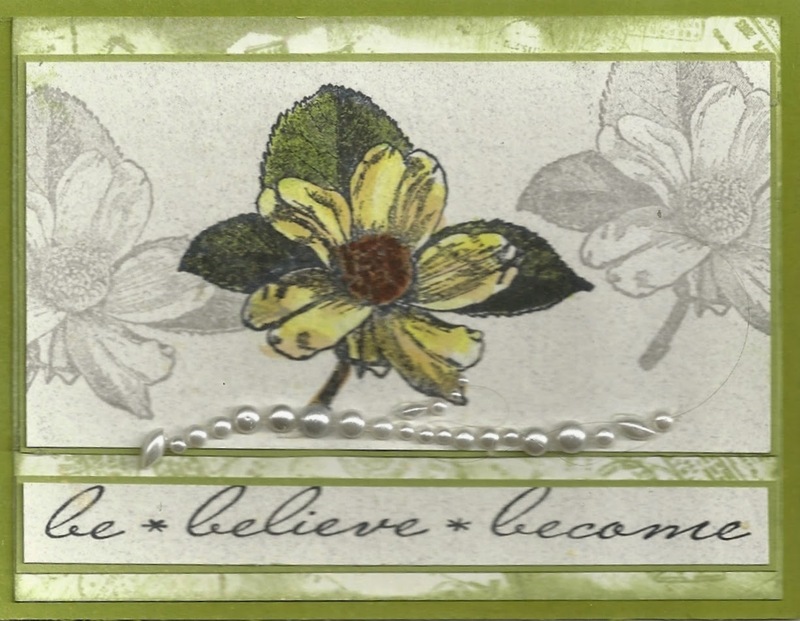 This blog post demonstrates how two different stamps were used for the same technique, but the embellishments, layout, and greeting stamps are different. The technique is called Slide Show and is from the April 2014 Technique Junkie newsletter. Both cards were colored with my Copic markers. 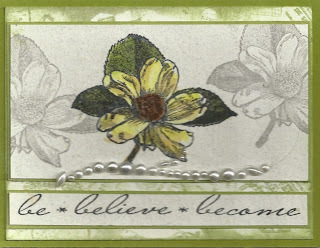 This flower stamp is called Dogwood Blossom - http://techniquejunkies.com/dogwood-blossom/, and the words are Be, Believe, Become - http://techniquejunkies.com/be-believe-become/. 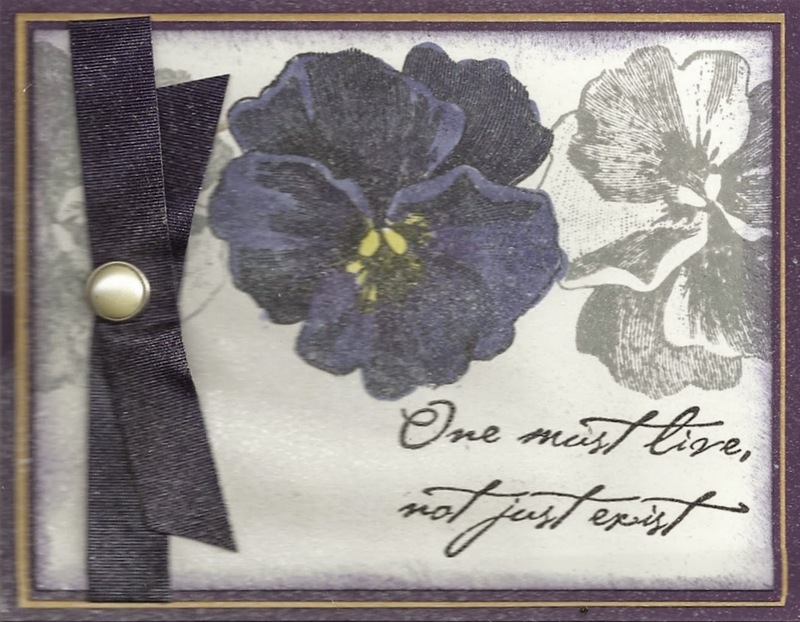 My next card uses this Pansy stamp - http://techniquejunkies.com/pansy/. The greeting is One Must Live - http://techniquejunkies.com/one-must-live/. I hope you all had a wonderful Mother's Day with your families. Any one who has followed me on the Technique Junkie Design Team blog posts has surely noticed how I love using the Antique Glimmers technique on cards. What do I love about it? It is easy. It is fun. It is "messy." It is different every time I use it. It creates beautiful backgrounds. You can easily stamp on it. So today I have three different cards to share with you that I used this technique somewhere on the card. I created these cards some time ago. Have a wonderful Saturday! Get inky! More May Releases - What Fun! 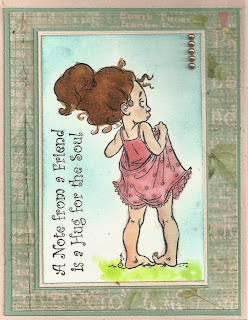 Wasn't the Blog Hop for the May Release of the Technique Junkie Stamps just awesome? How fun to see the new stamps and to see how the different members of the Design Team used the new stamps! I have two new cards for you this morning from the May Release. I used both of these same stamps in my blog post on Friday. I hope you enjoy them. Mt first card today is Free My Soul - http://techniquejunkies.com/free-my-soul/. The background is an embossing folder which I have sponged over ink to bring out the highlights of the embossing. 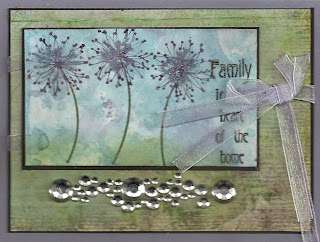 My stamped image was stamped on card stock that I used the Antique Glimmers technique. I stamped the image in Memento Tuxedo Black ink. I used a white gel pen to bring the words. I then used a Stardust Glitter over the white gel pen. I love the Star Fish Background stamp - http://techniquejunkies.com/starfish/ . I stamped the image on a sheet of Cougar White card stock which I used the Antique Glimmers technique. I then used sponge daubers with a variety of dye based inks to highlight the starfish and different shells. Then I used these two die cuts from chip board that I cut out. I used a technique from Powder Keg to emboss these two die cuts. I first pressed the shapes onto my Versamark ink pad and covered them with a base color that is now not very visible. Then using the only the flowers in the Whimsical Garden stamp - http://techniquejunkies.com/whimsical-garden/ - I inked the flowers with Versamark and stamped over the heat embossed die cuts over and over layering the colors. 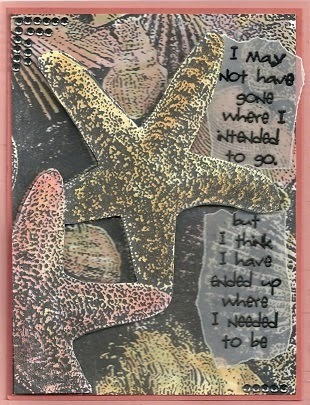 The inked image on the die cuts was from different areas of the Starfish stamp itself. Then I used black embossing powder. I used the little dotted sections for that. I still thought the die cuts needed a little more color so after heating the embossing powder, I just sprinkled a tiny bits of a few other colors. I will never be able to duplicate exactly what I did! And that is just fine. Now I want to remind you of the sale on the May Release Stamps -- You do not want to forget that! And the sale is only on until Friday. So don't delay in choosing what you want. All of the stamps come with cling foam and are ready to stamp! I hope you have a wonderfully INKY day! Welcome to this stop on the Technique Junkie Stamps Blog Hop featuring the May Release of new Technique Junkie stamps!. New stamps are being released today for Technique Junkie stamps. I love the many varieties of Technique Junkie stamps. There are so many varieties -- please go to the new website and poke around! http://techniquejunkies.com/ . And to celebrate the new May stamp releases, Pat is very generously offering a 15% discount for one week on all of the May stamp releases! Go here to see them all: http://techniquejunkies.com/may-2015-release/. Pat Huntoon has worked hard for months merging the two websites. I know that was shared with the April Release blog hop but it is worth saying again because she keeps improving the new web site. If you are starting here please go back and begin the hop here: http://techniquejunkies.blogspot.com/. I am the second blog in the hop. I was quite sad at the time of the April TJ Release blog hop because I was too ill to participate but I am almost at "full speed ahead" mode now. I created a lot of backgrounds today and stamped a lot of new stamps today as well. Now I will work on actually making those items into cards and projects. I have four cards for you today. Some of these cards use a previously released stamp --but every card features a "newly released" stamp. My first card uses the stamp "Free My Soul" SD600 - http://techniquejunkies.com/free-my-soul/. When my husband saw this card, he said, "I love that song!" I used background paper with musical notes. Then I used a tag and cut it out with a die. 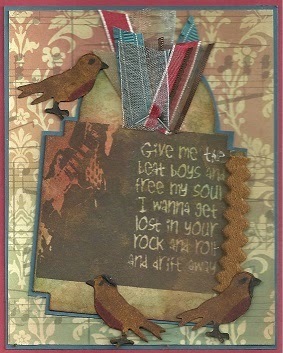 I used the Antique Glimmers to create the background and out of the scrap from the tag I cut out three birds. I colored them with Distress Stains using a black marker to add details. The stamp was inked and stamped with dark brown ink. I used a clear glitter pen to add highlights to the words. Various ribbons were added to the top and stapled down. My next card features the "Kitty Profile" S625 stamp http://techniquejunkies.com/kitty-profile/ which I have used before. The NEW stamp is "You Make Me Proud" SD612 http://techniquejunkies.com/you-make-me-proud/. What a wonderful stamp for a congratulatory card! How terrific for any person to hear that they make someone proud! I applied Distress Stains to a manila tag. Then I inked up the Kitty Profile stamp with black Stazon and stamped it at an angle on the tag. I mixed brown and gold Smooch Paints to color the eyes and used a white gel pen to add a highlight to the eyes. I also used the white gel pen to highlight the whiskers, and a clear glitter pen to add additional highlights. 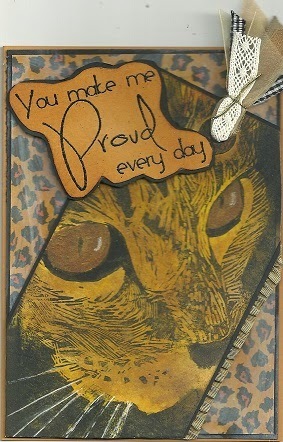 The leopard print background paper needed to be toned down a bit so I covered the paper with white Distress Stains. I heat dried it right away sol it would have a transparent feel. Threading some ribbons and tying them off with gold cording to finish the cat. The saying was stamped with black Versafine black and heat embossed with black detail powder. After I cut around the words, I layered it on black card stock, and cut around it again. The tag was also layered on black card stock. 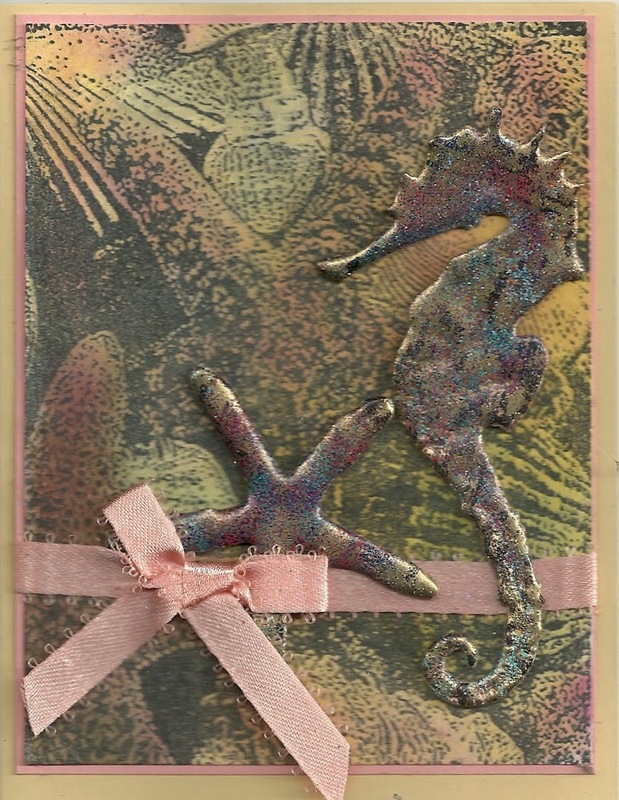 My next card features the lovely background stamp full of starfish - "Star Fish" S629 http://techniquejunkies.com/starfish/, and the verse "Needed To Be" on this web page - http://techniquejunkies.com/needed-to-be/ . I stamped two sets of images, and colored both sets with my Copic markers. Then I selected two starfish to cut out and pop up with pop dots. I used Glimmer Spray to add interest to the focal points. I stamped the verse on Vellum with Versafine black ink and heat embossed detail black embossing powder. I cut the verse in half, and tore the edges around the other three sides of the verse. I ran the verse through my Xyron machine to add adhesive to the back of each section. The black pearls were added as a final embellishment. My last card features two ladies I love! I have used them on many cards before - "Hat Ladies" - http://techniquejunkies.com/hat-ladies/. There is a different verse on the stamp, and I was very careful to not ink up the verse. I wanted to use the new May Release stamp "Good or Evil" SD602 http://techniquejunkies.com/good-or-evil/. 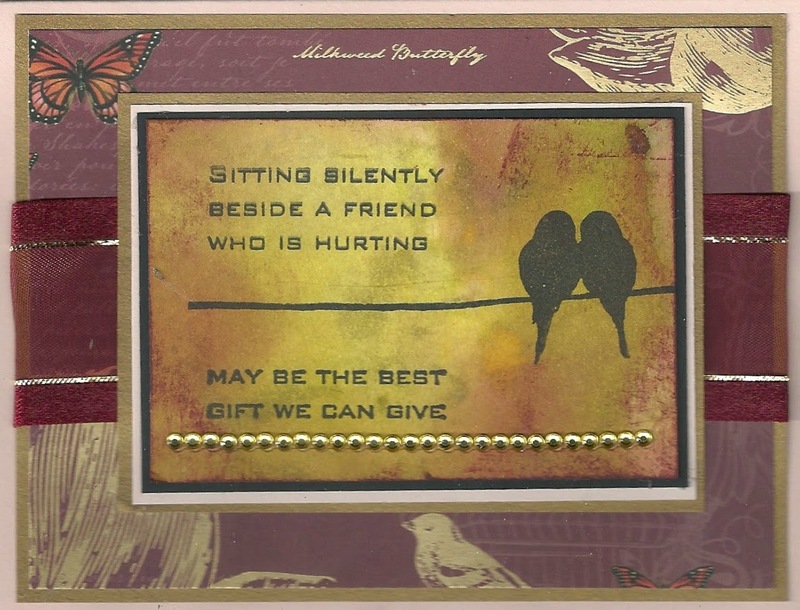 I used a center stair step die to create this card. I used Copic markers to color these adorable hat ladies. 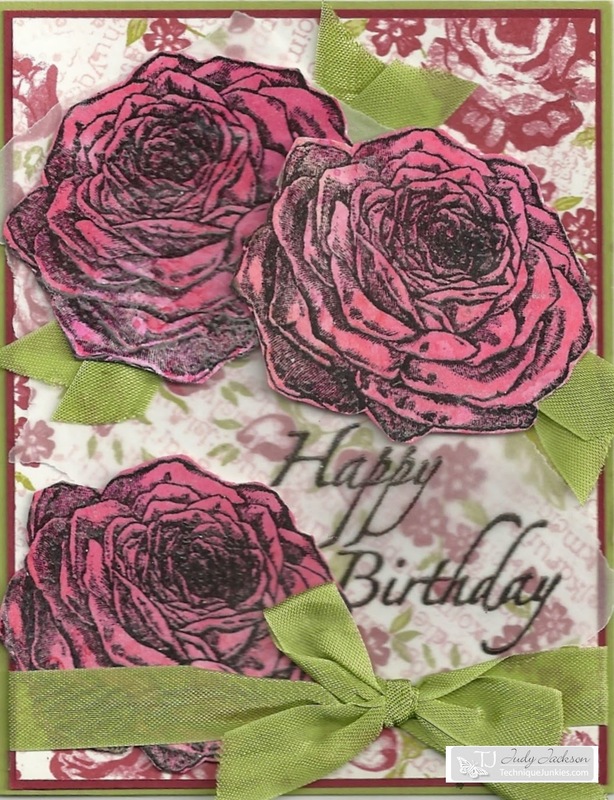 I used a flower stencil with Distress Inks to create the side panels. 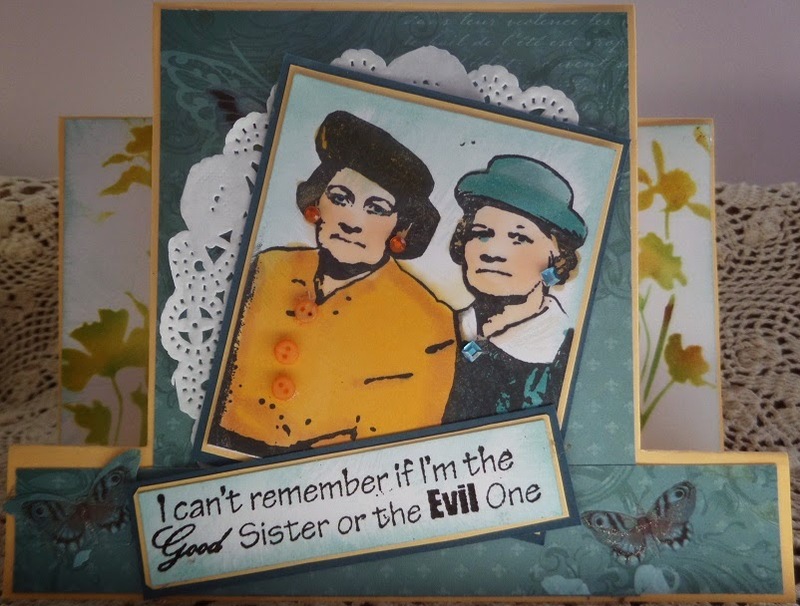 The verse "Good or Evil" SD602 as soon as I read it I thought of these two ladies. And in case you haven't seen the new Technique Junkie website -- Pat has new art products on the website. 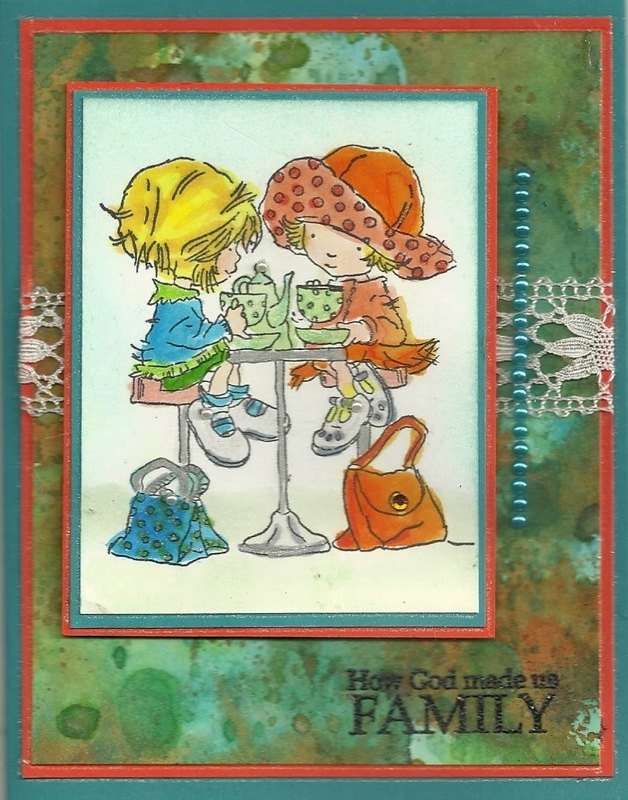 Pat Huntoon is ALWAYS looking for and finding new toys for stampers to use. The new things include stencils, art anthology colorations and art anthology dimensional mediums. I will tell you -- they are on my Wish List! This is the entire blog line-up. Make sure you visit them all - you will be glad you did! And lastly, I have one double of a new TJ stamp. It will be a surprise to one lucky winner. How can you become the winner of this stamp -- which will be a surprise! When there are a minimum of ten comments on THIS Blog Hop blog post, I will draw the name of one of the commenters. However, to claim your prize you must put your email address in your comment. Please for your internet safety, type your email address in this format: friendly stamper at email provider dot com. When you write it this way scammers will not easily seize it. Have a wonderful day! I hope you visit every blog in the above list! I am sure they will all be terrific -- as they sure were on April 1! Now hop along to Pam DeChellis's blog -- http://journeyawakensthesoul.blogspot.com. It will be wonderful! And don't forget --the 15% off the May Release stamps is only for one week!